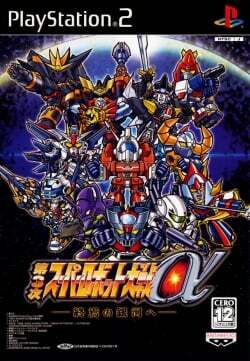 Game description: Dai-3-Ji Super Robot Taisen Alpha Shuuen no Ginga e is the 4th and final installment in the Super Robot Wars Alpha series. Alpha 3 continues to use the Squad System from its prequel, Dai-2-Ji Super Robot Taisen Alpha, where a maximum of four units can be assigned to a squad that counts as a single unit. Since all playable mecha are of different sizes, a size limit is placed, thus the player must consider building an effective squad. The system also received several improvements including Auto-Generate squads based on different attributes, improved squad attack animations, and more. Alpha 3 also includes 60 new stages and bonus stages and 3 possible endings. This page was last edited on 18 April 2019, at 01:42.